The UN peacekeeping mission in the Democratic Republic of the Congo has been providing assistance to the election process. 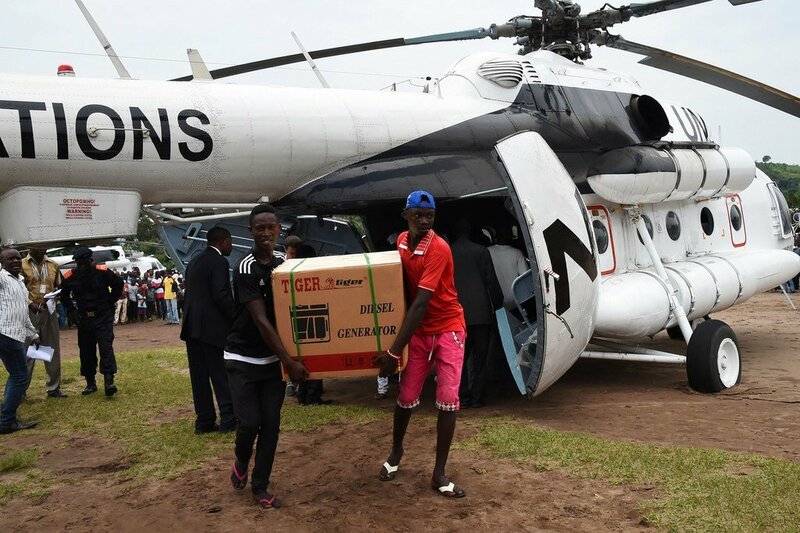 Here, in March 2017, a generator is unloaded from a UN helicopter in Popokabaka in the south-west of the country. December elections in the Democratic Republic of the Congo (DRC) remain on course, but still face “major challenges”, including violence from armed groups in the country’s east, the top United Nations official in the country said on Thursday. The situation is most worrying in Beni, where civilians, security forces, and the UN peacekeeping mission in the DRC (MONUSCO) continue to come under near-daily attacks, Leila Zerrougui, the Special Representative of the Secretary-General for the country, told the Security Council via video link from the capital Kinshasa. “Despite this tempo of attacks,” she said, MONUSCO’s Force Intervention Brigade has “taken an increasingly robust posture in recent months,” she said. The volatile situation has also complicated the response against a deadly Ebola outbreak in the region which began in August, with local populations in some areas showing mistrust towards health workers and in one case attacking a health convoy, added the senior UN official. “Responders are currently grappling with the issue of simultaneously scaling up response efforts, both in Beni and in other nearby areas, while adapting the footprint to the deteriorating security situation,” she said. In her briefing, Ms. Zerrougui, who is also head of MONUSCO, highlighted that the electoral process continues to follow the set timetable, with 21 candidates vying for the presidency; 15,505 for the national assembly; and some 19,640 for provincial assemblies. She regretted that women’s participation has been very low so far, with only 12 per cent women contesting seats in the national and provincial polls, and only one female candidate for President. Ms. Zerrougui also thanked members of the Security Council, who undertook a recent visit to the country and gave them a unique opportunity to witness first-hand the situation on the ground. Also briefing the Council alongside Ms. Zerrougui, Said Djinnit, the UN Special Envoy for the Great Lakes region, reiterated the importance of peaceful and credible elections in the DRC for stability in the region. In that context, his efforts focus on mobilizing “concerted regional and international support” to bring the 31 December 2016 accord to fruition – a political agreement facilitated by the Catholic-affiliated Conférence Episcopale Nationale du Congo (CENCO), aimed at achieving a peaceful, managed transition of power, consistent with the DRC’s constitution. “I encourage sustained regional engagement in support of peaceful, credible and inclusive elections in line with the Agreement,” he added. 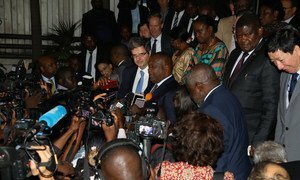 The United Nations Security Council is on a visit to the Democratic Republic of the Congo (DRC), where on Saturday the body’s 15 members pledged to support the process in the run-up to long-delayed elections, set for late December, and called for the polls to be credible and peaceful.